What are the chances of getting two Independant customers at the same time wanting O2 serviced twin steel 72 cu. ft. cylinders & manifolds, powdercoated white & filled with Nitrox? Not all steel 72’s are alike, some made by Pressed steel tank, Norris to name a couple so there are slight subtle shapes & size differences as you can see in this photo. Why invest good money in these old tanks? 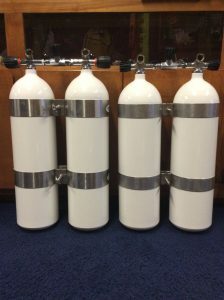 2250 psi rated Steel 72’s were made with a much better steel alloy than newer high pressure cylinders of today, always pass hydro if cared for, can always be filled to capacity, their buoyancy is great and 72’s make an awesome set of double’s. You could say that these doubles are more than worth the trouble’s! Copyright © 2019 Openwater Habitat.